In Memoriam - Appellate Defenders Inc.
Paul Bell, the assistant executive director of ADI from 1979 to 1997, was born on March 29, 1945. He graduated from Seattle University in 1967 with a degree in political science and received his law degree from UCLA Law School in 1970. He started his career as an Orange County Public Defender and went on to work as a research attorney with the San Bernardino Court of Appeal. In 1974, when the office was barely one year old, Paul became a staff member of Appellate Defenders, Inc. His ascension to the assistant director position in 1979 was a "natural," given his intellect, accomplishments, leadership, and unstinting commitment to our work. Paul died on July 30, 1997. Paul’s life was made up of great loves – love of his family, love of his church, love of his career in the law and his career "home" at ADI, and love for an enormous range of human activities – scouting, trains, hiking, country music. He loved his career in the law and was very good at it. He had an amazing way of writing complicated arguments simply and understandably. Paul could often come up with a fresh approach to a problem that had stumped everyone else. He had an amazing store of information: ask him a question about almost anything, and you were likely to get not only an answer, but an epic. He handled hundreds of cases and worked on countless projects from writing guidebooks and manuals, to promoting employee benefits, organizing volleyball and softball teams, developing new attorneys on the staff and panel, and holding the office up time and again when its very existence was threatened. Paul argued before the California Supreme Court on six occasions, posting an impressive win record of five wins out of the six appearances. Paul’s work at Appellate Defenders changed the face of criminal appellate law, effecting changes in the areas of delinquency, juvenile dependency, welfare law, no-issue cases, and sentencing. One of the most notable was the case of People v. Wende (1979) 25 Cal.3d 436, which provided that criminal appellants were entitled to an independent review of the record by the appellate court when appointed counsel discerns no arguable issue. 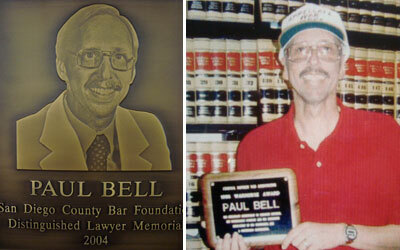 In 1995, Paul served as the chair of the San Diego County Bar Association’s Appellate Court Committee. His passion for the law was surpassed only by his love for his family. Paul and his wife Dianne were married for 25 years. His two children Daniel and Andra carry on Paul’s commitment to excellence and humanity. Without our dearly loved friend, Paul." It is still hard to imagine ADI without Paul. We speak his name often and reminisce over all the times we spent with him. His spirit lives on in almost tangible form, and his love for his friends and work endures. Ernie Palacio was a champion for ADI and the entire system of indigent representation on appeal in California. He started with ADI in late 1983 and for most of that time was the Legal Administrator, in charge of managing all of our cases and supervising our paralegal staff. He played a vital role in developing the statewide appointed counsel system. Even more, Ernie, "Mr. ADI," was in many ways the heart and soul of the office. He had a breathtaking work ethic, the ability to relate easily to others, and extraordinary gifts of wisdom, intelligence, honor, and compassion. Ernie came to ADI as an unpaid paralegal student intern. The state agency funding ADI had itself just lost funding, and the office was struggling to start a new system. Ernie worked long hours and proved incredibly bright, upbeat, and helpful. He was so impressive that he was offered a position at the end of his internship, even though hiring him was financially problematic. This was the best investment we ever made, and not only ADI but the legal community has been the beneficiary. Ernie continued in his paralegal position for several more years, repeatedly demonstrating an amazing range of skills, adaptability, leadership, and a work ethic of breathtaking magnitude. When eventually it became apparent that ADI had outgrown its humble beginnings and needed full time official supervisors and administrators, the choice of Ernie to be our paralegal supervisor and the administrator of our entire caseload was a "no-brainer." He never looked back. He was instrumental in the growth of the office from a small outpost of the State Public Defender, handling about 200 cases a year, to the pioneer and mainstay of the appellate project system, now handling almost 3,000 a year, covering all divisions of the Fourth Appellate District and dependency as well as criminal cases. He developed our computerized case management system from scratch – an "Old Faithful" that even past the age of 20 years served us well. A colleague at another appellate project summed it up in one word: Ernie was "priceless." For his many and monumental accomplishments Ernie was honored in 2007 with the Distinguished Citizen of the Year award from the San Diego County Bar Association. He died on December 4, 2006, at the age of 45. Ernie's family – wife Linda Cartwright and son Jake Palacio – remain members of the ADI family. 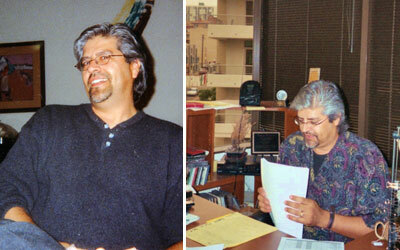 And his brother, Omar Palacio, has been a mainstay at ADI since 1990; he is now our Case Management Coordinator. We honor Ernie for giving 23 years of unstinting effort, genius, and devotion to our office. He was profoundly loyal and was always there for us, to do what needed to be done, from the most sensitive, complex, and demanding to the "get-your-hands-dirty." He left a powerful and enduring legacy in his work and in his friendships. Whenever we need help with a difficult task, a bit of wise guidance, or his calm reassurance – in short, many times each day – we miss our colleague and dear friend and call on that legacy to get us through.